Fantastic court location for this warm & inviting home in Vista. Quiet & tucked away street is the perfect address. Backing on to a natural reserve has definite appeal as well as the walkout basement feature. The large entrance is great for welcoming guests or for the whole family to enter with ease & comfort. A bright & sunny living room with potential 'dining' area is open & airy with its vaulted ceiling & adequate windows to let in the light. A stunning kitchen offers granite counters, tiled backsplash, stainless appliances, corner pantry & a sit up breakfast bar. Garden door leads out to the spacious covered deck overlooking the spacious backyard & open area behind the property. Laundry room, 2 bedrooms & main bath complete the main level. Up a few steps sits the generous master suite complete with walk-in closet & ensuite with jetted tub & separate shower. A fully developed basement walks out onto a patio & right into the yard. Great space found in the bright family room & entertainment area featuring a wet bar, nook which is great for an office or play area, 4th bedroom & another full bath. 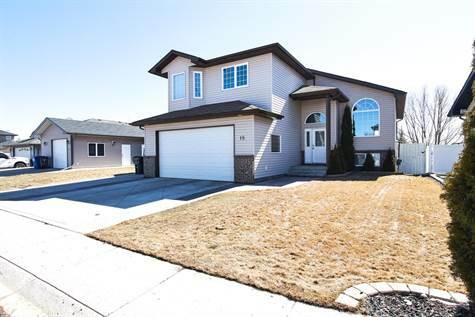 Attached garage is heated & ample driveway parking. Storage shed, additional storage under the deck & a convenient dog run with garage door access. The yard is nicely landscaped with fruit trees & comes with underground sprinklers. A perfect place to call home! !